Salad nicoise is a tradition all over France and Italy as well where it's called insalata nizzarda. The salad that gets it's name sake from Nice where it originally consisted of raw red peppers, shallots, artichoke, tuna and topped with anchovies. Some French traditionalists believe potatoes should never be included in this delicious salad made famous by one of the most beloved chefs Julia Child. In fact some believe no cooked vegetable should ever be included in the salad. I say sacrebleu! 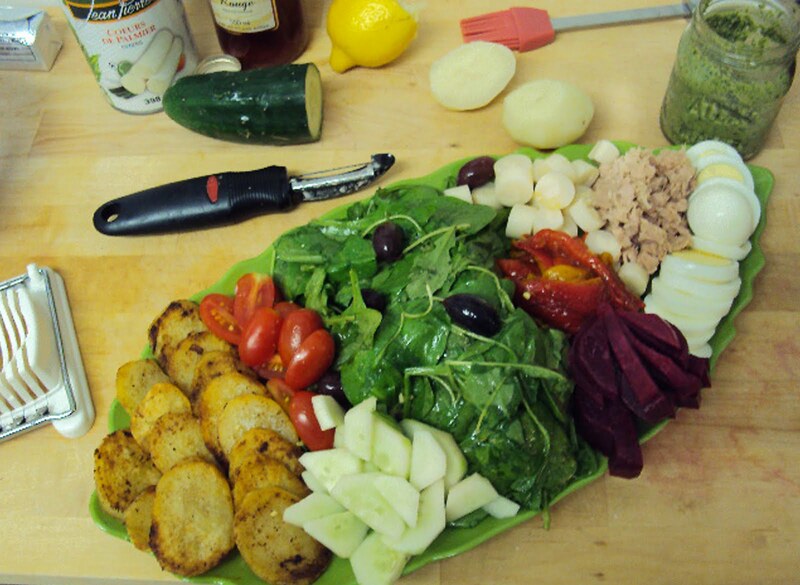 use whatever you like in your not so nicoise salad. The one rule I will give you however is to serve on a family style plate so that everyone can take what ever toppings they desire. Also it looks so pretty all laid out like that. continue to whisk while slowly adding oil. parsley pesto that I slathered on toast to serve alongside the salad. I'll post the recipe for that another time. I'd have to make this with chicken because I'm allergic to tuna...but your version and the picture is stunning! It looks absolutely delicious! Hi Ann, It's not uncommon to make this with grilled or canned salmon or another kind of fish. Chicken would also be good - you may want to poach the chicken for this salad! Thanks for visiting.